The Denver Broncos’ last 16 days have been an extremely busy time for a team that ended the regular season with an AFC West title and a 12-4 record. After the terrible playoff loss on January 11th the team unexpectedly, “mutually parted ways” with the very successful John Fox and reunited with Gary Kubiak. Since his hiring on January 19th he has been busy assembling his staff. As of Monday, he has only two positions left to fill. 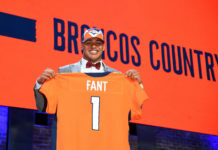 Of the several newcomers to the Broncos staff every one has former connections to Kubiak within the Broncos or the Houston Texans organization. The Kubiak era has begun and the familiarity he shares with his staff should enable them to get to work quickly. The day after Kubiak landed in Denver it was reported that longtime teammate and coach, Rick Dennison would be joining him. Monday the Broncos officially agreed to terms with the Rocky Mountain High School and Colorado State graduate. 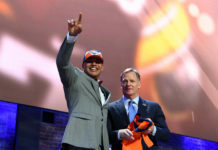 Dennison was a nine-year NFL player with the Broncos and a teammate of Kubiak’s before joining him in the coaching ranks. Dennison started with the Broncos as an offensive assistant in 1995 and eventually took over as the offensive coordinator from 2006-08 when Kubiak left for the head coaching position of the Texans. Dennison joined Kubiak in Houston in 2010 and followed him to the Baltimore Ravens in 2014. Dennison is well versed in the zone-blocking scheme that Kubiak has used in his 21-year coaching career. Dennison will replace Adam Gase who coached the Broncos since January of 2013. Gase followed John Fox to coach the Chicago Bears offense next season. Last Tuesday the Broncos announced that they had agreed to terms with Joe DeCamillis to become the team’s next special teams coordinator. DeCamillis has 27 years of NFL coaching experience, 22 as a special teams coach. He started his professional coaching career in Denver in a football administration position in 1988 and then was hired as a defensive quality control coach in 1990. He has since coached special teams for the New York Giants (1993-96), the Atlanta Falcons (1997-2006), the Jacksonville Jaguars (2007-08), the Dallas Cowboys (2009-12) and most recently the Bears (2013-14). He is replacing Jeff Rodgers who also followed Fox to Chicago after coaching the special teams unit for the past four seasons. The longest tenured coach to be retained by the team is Clancy Barone but he will be changing coaching positions. After the coaching the tight ends for five of his six seasons with the team, he will now be the offensive line coach. He has 28 years of combined coaching experience with 11 in the professional ranks. His switch over to the line will allow Kubiak to bring in a familiar face to coach the tight ends. Along with the reported hire of Dennison over a week ago, it was also said that the Ravens and former Texans tight end coach, Brian Pariani would be joining the Broncos. The team has yet to agree to terms with the coach but there has been little speculation to the contrary. Pariani coached with Kubiak in Houston during his entire tenure as head coach. Kubiak and Pariani have always gotten a lot out of the tight end position in their offenses and it seems to be only a matter of days before it becomes official. Pariani, along with Dennison where busy coaching in the Pro Bowl this past week. Barone will be replacing Dave Magzu, who coached the offensive line on Fox’s staff in the past 12 seasons and once again, followed him to Chicago. Despite the constant shifts along the line due to injuries, Magzu got the most out of his players during his time in Denver. In his four years with the team they allowed the fewest sacks in the NFL. Monday, Reggie Herring was hired as the Broncos new linebackers coach as Richard Smith left for the Atlanta Falcons. Herring coached linebackers for the Texans (2002-03, 11-13), the Cowboys (08-10), and the Bears (2014). Herring coached with Kubiak in his second hire with Houston and coached DeMarcus Ware in Dallas. He will likely be an enormous help if the defense eventually changes to a 3-4 scheme. Herring replaced Smith, who was earlier assumed to be staying with the Broncos. Smith was Kubiak’s defensive coordinator from 2006-08 and was on the Broncos coaching staff from1993-96. According to Mike Klis of the Denver Post, he took a senior defensive position with the Falcons. Bill Kollar was announced Friday as the Broncos new defensive line coach. Kollar has 26 years of NFL coaching experience and has been with the Texans the last six seasons. There, he built a formidable line, coaching the likes of Mario Williams and J.J. Watt. Kollar also spent time coaching the Buffalo Bills (2007-08), St. Louis Rams (2001-05) and the Falcons (1990-2000). Kollar will be replacing Jay Rodgers who will join Fox in Chicago. Rodgers coached the Broncos defensive line the last three seasons. The remaining two coaching positions that have yet to be filled are important ones. First of all, the defensive coordinator job remains open. The Broncos appear to be set on Vance Joseph but the Cincinnati Bengals have refused to allow the defensive backs coach to leave his position with the team. Joseph has one year remaining on his contract and the Bengals are not obligated to oblige the Broncos or Joseph. Several reports have stated that the two teams are continuing to try and cooperate. The fact that the Broncos have yet to move forward with other candidates shows the amount of interest they have with the young coach. Johnson also has ties Colorado. He played quarterback for the University of Colorado before moving to cornerback in the NFL. He coached with Kubiak from 2011-13 as the defensive backs coach. Joseph also interviewed for the Broncos head coach position earlier this month. The other two leading candidates are Wade Phillips and Mike Smith. Phillips is a former Broncos defensive coordinator and head coach and also was a coach on Kubiak’s staff from 2011-2013. Smith was a defensive coordinator for Jack Del Rio in Jacksonville before becoming the head coach of the Falcons in 2008. He was fired following a disappointing 2014 season with the team. Former defensive coordinator Del Rio was named head coach of the Oakland Raiders just days ago after interviewing prior to the Broncos loss to the Colts in the playoffs. Del Rio did an excellent job with the defensive free agent signings last year and produced a top-ten defense in the 2014-15 season. Lastly, the secondary coaching position remains vacant after Cory Undlin joined the Philadelphia Eagles staff for the same position. He coached the Broncos secondary the last two seasons and helped form a unit that produced three Pro-Bowlers this season. While the defensive coordinator position remains open, little has been said about who the likely candidates are to replace Undlin. With the talent of Chris Harris Jr., Aqib Talib, T.J. Ward and the emergence of Bradley Roby the position offers a spectacular opportunity for any coach. The Broncos also retained some vital coaches from the 2014 season. Longtime running backs coach Eric Studesville will remain at his position, as will third-year quarterbacks coach Greg Knapp and fourth-year wide receivers coach Tyke Tolbert. 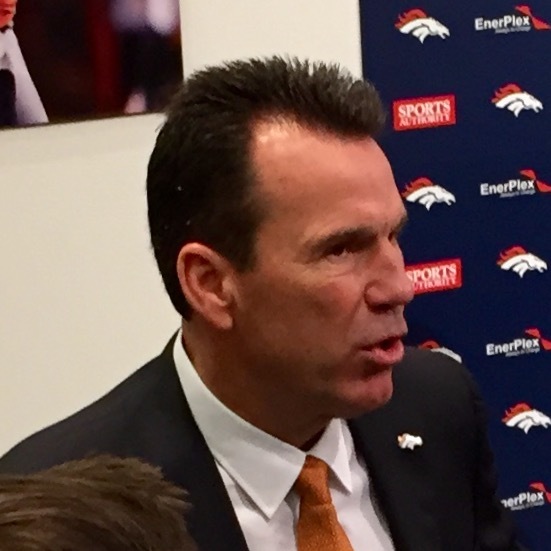 Kubiak has thus far surrounded himself with experienced and familiar coaches for his return to the Broncos. Yes, almost all of them have prior relationships with Kubiak, but they also have post season and Super Bowl experience. As the offensive-minded coach finishes off his hires he will undoubtedly be very cautious has he decides who will lead his defense. With the clock ticking and coaches being signed daily the pressure will increase and the choice will need to be made quicker then he may like.